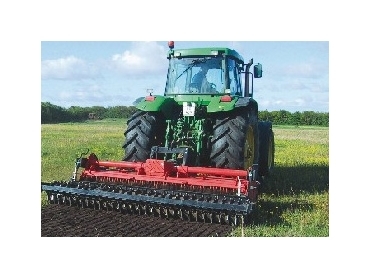 Daken ASV have three types of model available in their tillage range. The Muratori rotary hoes are used for tractors with a HP of 10 to 120 and a working width of up to 3m. These machines are ideal for use in small market gardens and come in six models. Each model has a different size and hp. The Muratore rotary harrows too have the same hp and working widths and are available in three different models. The mw1 range has the option of a grass seeder which can create a one pass tool. Muratori Stonebarriers are rotary hoes which have a reverse tyne rotation for when the soil is rocky. These machines can also tile lawn and turf soils. This process requires much less power and can save time as stones, grass and trash need to be buried under a layer of clean soil.